KidsFit Cardio Kids 601 Elliptical Trainer This popular elliptical trainer works their entire body and has been carefully designed to supply more balance for fast growing bodies and motivational easy to use electronics that include calories, heart rate, speed, time and distance. Smooth gliding motion of both upper and lower extremities. Slow to fast rhymthmic gliding. User can isolate lower body and position hands over pulse sensors. Ability to reverse stride, activating different muscle groups. Shipping Weight: 110lbs. + 30lbs pallet = 140lbs. Call 1-800-875-9145 to speak with one of our fitness advisors with any questions you may have. How do we put a price on our kids overall wellnes and their future - Go to FitnessZone.com today to order the KidsFit Cardio Kids 601 Elliptical Trainer and let's give our kids the advantage they deserve. 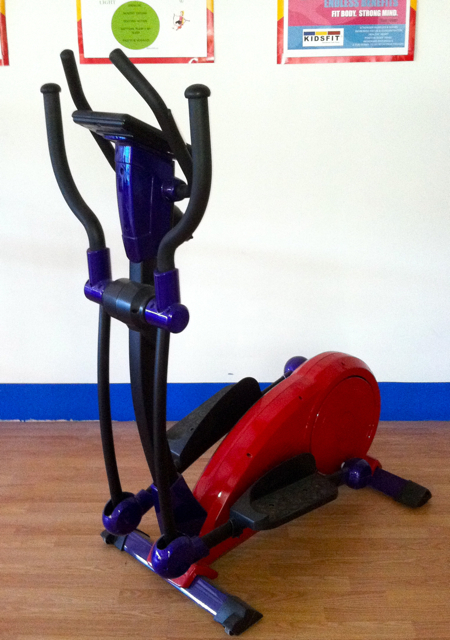 Order your KidsFit Cardio Kids 601 Elliptical Trainer from FitnessZone.com today!